Tawag ng Tanghalan Quarter 3 semifinals on It's Showtime has just concluded. Three of the 5 semifinalists went home and 2 made it through the grand finals. Advancing to the grand finals are Noven Belleza from Visayas and Eumee Capile from Luzon. 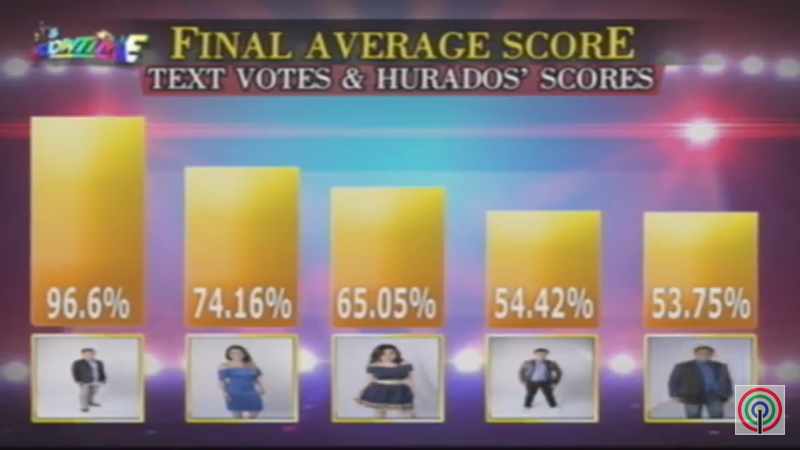 Metro Manila's Jennie Gabriel and Lucky Robles and Luzon's Antonio Sabalza have been eliminated. Based on the voting results, Noved topped hn text votes, followed by Eumee and Jennie. Judges' scores on one hand show that it's Eumee got the highest score from the judges, Jennie was the 2nd highest and Noven was only 3rd. When combined, the Bukid Boy Wonder ng Visayas still ruled with a final average score of 96.6%, while Eumee came in far 2nd with 74.16%. Mindanao, Mary Gidget dela Llana from Luzon) and Quarter 2 (Pauline Agupitan from Luzon, Marielle Montellano from Visayas). While there are already 3 from Luzon, 2 from Visayas and 1 from Mindanao, no one from Metro Manila so far has qualified to the finals.